The roots of Arlington Woods Free Methodist Church can be traced to the founding of the Westboro Gospel Mission as a non-denominational church by Rev. John Scobie in 1930. Church services were first held in the Westboro village community hall located at the corner of Richmond Road and Athlone Avenue in Ottawa. The hall was rented for $12 a month, a large sum at the time. The corner lot next to the village hall was vacant, but was put to God's use for holding tent revival meetings. The life of Rev. John Scobie is an excellent testimony of how Jesus can transform a person's life as a result of repentance and faith in Him. He carried the full workload of pastoring the Mission by himself for 7 years until his death in 1937. At the time of Rev. Scobie's death, Rev. William Thomkins was holding a series of revival meetings in the Mission. He was asked to continue as a pastor until a Church Board could be established. Change in one person's life is often difficult to adapt to; this is no less true for a church. Over the next few years, many left, became discouraged, and were unable to see what the future could hold for them in such a small Mission. By 1942, when Rev. William Hamilton took over the Mission, the congregation was down to less than 30. Richard Burman, the holder of the keys to the Mission, planned to close the church doors, however, he was persuaded by Rev. Hamilton to keep the doors open. Rev. Hamilton promised to look after the finances and the rent until a proper Church Board could be reorganized. When this was done, Rev. Manley Pritchard was called to be the first full-time pastor in 1942. Two big changes occurred soon after Rev. C.F. Bowen became the senior pastor in 1947. First, in 1948, the Mission was renamed Scobie Memorial Church and a stone building was constructed "with great sacrifice and love" on the vacant lot where the tent meetings were held. Second, in 1950, the congregation decided to align its doctrine with that of the Holiness Movement. Above photo from Ottawa Citizen, April 8, 1949. Full article about dedication to be found here. The 1950's was a period of stability as the church grew only slightly in size. In 1960, while Rev. Archibald Moors was pastor, the Holiness Movement was formally united with the Free Methodist denomination. 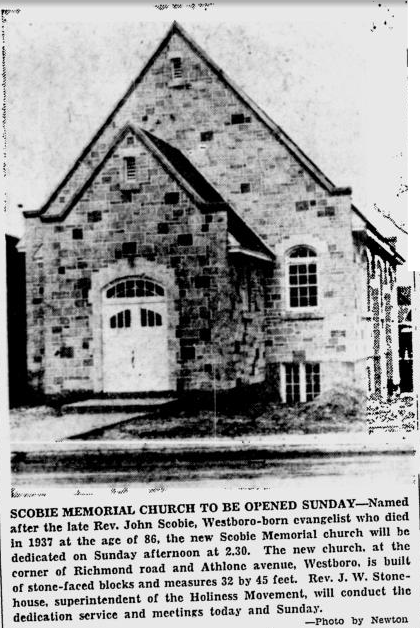 Thus the little church was again renamed as the Scobie Memorial Free Methodist Church. By 1963, the growing church faced a problem of space. The congregation of 50 people decided to build a larger church at a new location. In 1967, Rev. Robert Dargan became the pastor. When he saw how the congregation wished to relocate, he immediately put his energies behind the project. Frequent prayer meetings were held during this time to seek God's will on the matter. The little stone church was sold and a piece of land on Greenbank Road was purchased for the new building. The farewell service was held on April 26, 1970, and the congregation moved the service to Knoxdale School on Greenbank during church construction. Shortly afterwards, problems were discovered with the property on Greenbank Road. A settlement was then reached to exchange the Greenbank Road property for an even larger 2.5 acre lot on McClellan Road (our present location), described as "one of the few pieces of God's country left in metro Ottawa". What grand visions for a congregation of a little more than 50 people! On June 5, 1972, the sod was turned and the $160,000 building project was underway. The church was again renamed as Arlington Woods Free Methodist Church. The new building was to hold 300, with 14 Sunday School rooms, a kitchen, library, pastor's study, lounge, and a sanctuary with a pointed curved roof to compliment the surrounding stately pines. (This is our present Fellowship Hall). 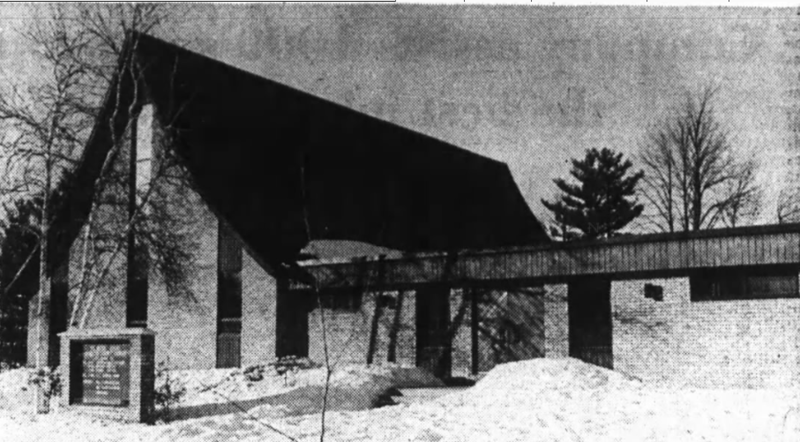 Five months later, on November 5, 1972, the first service was held in the new building with 213 people attending the service, and 166 at Sunday School. We rejoiced while the rain pelted! The building was later officially dedicated by Bishop Edward John on May 13, 1973. Above Photo from Ottawa Journal, March 4, 1978. Full article here. After we moved to the new church, our congregation continued to grow rapidly. By 1985, under the leadership of Rev. James Kesselring, the congregation had again outgrown the originial facilities, and the "For His Glory" fundraising campaign, aiming at church expansion, began. By 1989, the fundraising target was achieved. The sod turning ceremony for the new expansion, officiated by Bishop Donald Bastian, took place on February 11, 1990. For the next year during the construction, we met met Sir Robert Borden High School for our services. On February 24, 1991, we came home to our newly enlarged building with a magnificent sanctuary that can hold 600. The early 1990s was another period of growth in our church. By 1995, our numbers grew to over 500. In July, 1995, Rev. Kesselring, who had been the longest serving senior pastor in our 65-year history, followed God's leading and left for Toronto to minister to ethnic minorities. Subsequently, two senior pastors arrived and departed. Rev. Wayne Dawes served for 3 months, and Rev. Mervin Saunders served for 14 months. During this difficult times, we could only rely on our faith to persevere. However, while there are troubles, there is God's grace to His children. The church grew slowly, yet steadily, and in October 1998, an anonymous donor paid off the mortgage of our church building with a generous $237,000 gift. Rev. Dargan wrote these words in 1973: "Our prayer is that the Holy Spirit will lead each person who comes to the church; members, adherents, and friends; into the Deeper Life in Christ, so that someday we may rejoice that we have such glorious opportunities to work for the Lord. The church is only here because God worked miracles. We give him all the praise and glory for working through so many dedicated people. May the doors of this House of God be wide enough to receive all who need human love, fellowship, and care; narrow enough to shout out every envy, pride, and hate. May it be for all- aged, youth, and childhood- the Doorway to Christ's Eternal Kingdom."